Our services as basketball court contractors include full construction projects for basketball and multi use sports surfaces, as well as professional painting and maintenance services for these various facilities. We carry out the full works for an installation of basketball courts for numerous specifications to suit a range of organisations and uses. 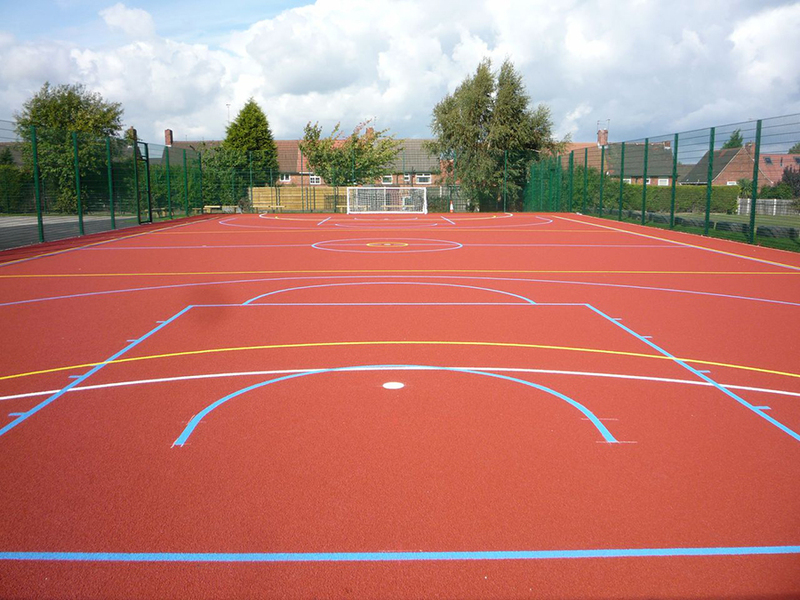 As contractors, the types we typically install for a facility are macadam and polymeric rubber; these two specifications are specially designed to create the ideal amount of ball bounce for playing during practise and matches. 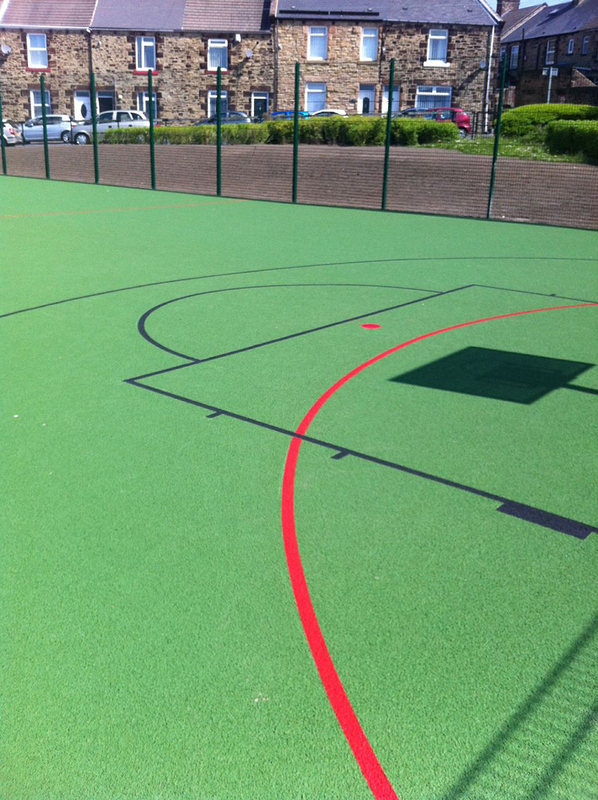 Non slip paint coatings may be sprayed onto these hard surface types to improve the grip within the sports court and enhance the playing qualities for other sports like netball if you’re going to use the area as a dual purpose facility. 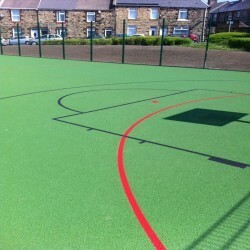 With our wealth of experience as contractors we can help you to design the perfect specification for your project whether it’s for professional use or a recreational multi sports area. Each aspect within the design could be tailored to meet your requirements and budget, for example the size and dimensions could be altered to fit the space you have available, and extra features like fencing may be installed in a range of specifications and heights. Maintenance advice and equipment are also available to help you keep the new facility looking and playing great once the initial construction is complete. If you would like advice about the costs of basketball court installation http://www.basketballcourtcontractors.co.uk/costs/ please use the short contact form on this page to send us your details. As contractors, we will get back to you with some professional case studies and product sheets as well as a price estimate. 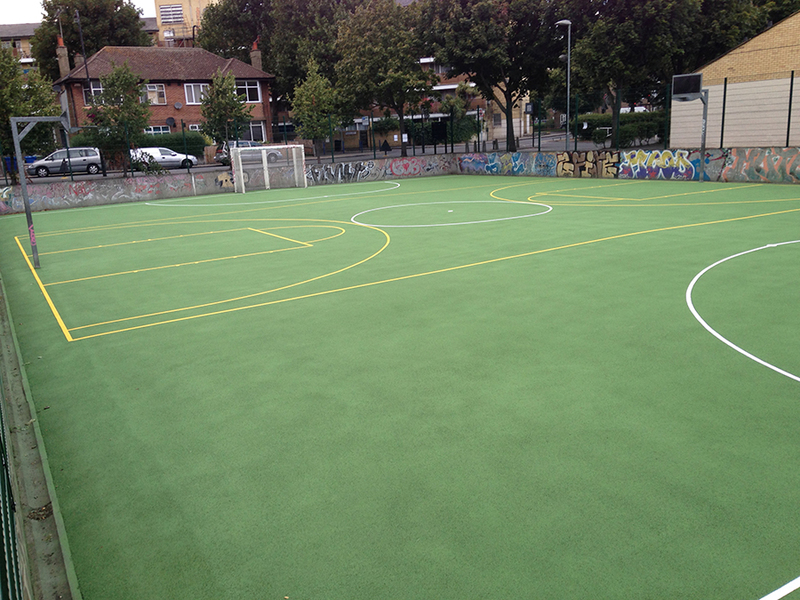 We are one of the leading outdoor surface contractors in the UK and we have undertaken many projects for schools, colleges and clubs to build new top quality sports courts and renovate existing ones. All sports surfacing types we use are 100% porous so they can be used in all weather conditions without the risk of flooding. Both the macadam and polymeric flooring systems we install provide the perfect playing qualities for basketball and can also be utilised for other activities, making them a popular choice for schools which may not have the space to install numerous different facilities. As we can install a range of different designs, the basketball surface dimensions http://www.basketballcourtcontractors.co.uk/dimensions/ can be altered to fit with your school, club or leisure centres existing facilities. This is also a great option if you are looking to build a multipurpose area. 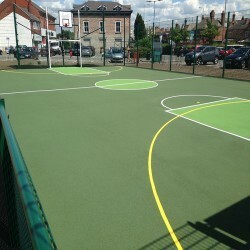 As local specialist court installers closest to you we are able to provide you with a range of surface options http://www.basketballcourtcontractors.co.uk/surfacing/ to ensure you find exactly what you are looking for. We have years of experience and specialist knowledge to give you the results that are suitable for the surrounding areas. We work across the UK and have carried out numerous installations. Speak to our team today if you're interested in finding out more information and receiving the details you require. However, don't worry as our team are always happy to help you in ensuring your nearby court is repaired and is completing its purpose effectively. Whether this is through simple evaluations of your court after installation or services such as repairs, the team will be able to visit your facility. All you need to do to gain these service is complete the provided enquiry form below. Our experience as contractors spans over 15 years and our knowledgeable staff would be happy to help with any questions you have regarding surface costs, specifications and construction. Each project we carry out is completely different and we offer costs based on a number of factors including the site location, existing conditions of the area, and of course the design facility itself. Please use our contact form to send us the details of your enquiry and a member of our team will assist you in answering any questions you have regarding our basketball court contractors [POSTCODE] and offering a quote for your surfacing project.